As wide as an ocean, as deep as a pond. Hype is dangerous. When you're excited about a new game for too long, your expectations grow unreasonably high. While sometimes the game delivers on that hype, more times than not it falls flat. It either becomes a historical letdown akin to No Man's Sky, or the project gets shut down to avoid the inevitable fanbase flame war. Half-Life 3 is a good example of this. 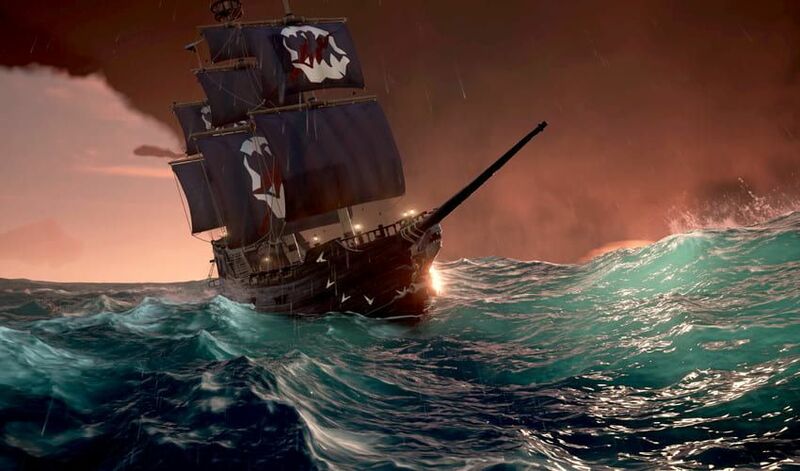 Considering Sea of Thieves has already released, the former is more likely. There will be a number of comparisons to No Man's Sky and Sea of Thieves. Both games were hyped heavily by a big name publisher (Microsoft/Sony), they both have unique and refined features, yet with all of its expansive ambition, it feels fairly empty. Despite these downfalls, I rather enjoyed both games. Sea of Thieves is advertised as a pirate game, though little piracy is needed. Players spawn at a local outpost, where they can accept quests (referred to as "voyages") from three different factions. One offers combat, directing you to an island inhabited by a skeleton crew. One offers treasure maps, offering gold for the chest you find there. One offers trade goods, giving the players a time limit to hunt down certain supplies and deliver them to a different outpost. Once decided, you can hop aboard your ship and sail off towards your goals. Sailing is a majority of the game, and those mechanics are more true-to-life than one may expect. Players have to actively raise the anchor, lower and angle the sales, even bucket out water that accumulates from below decks. The cannons are loaded manually every time they are used. This deeper level of nautical skill, combined with an amazingly well-refined ocean wave engine, makes for an extremely pleasant sailing experience. The first night I played, I was sailing east to deliver a crate of something or other and a large storm had developed directly between me and my destination. The heavy rain, rough waves, and gale winds busted holes in my ship, filled my decks with water, nullified my compass, and spun my ship's wheel wildly. I had to juggle between repairing my boat, pulling water from below, and regaining control of my ship. My only reliably guide east was the setting sun, barely visible through the storm. Once I was back to calm waters and open skies, I had to stop and mentally recuperate from the experience. Memorable moments like these are all too uncommon in video games. That's all there is to the game, unfortunately. The main problem with Sea of Thieves is the lack of content. While what they do have is well optimized and the view of the ocean from your ship is nothing short of beautiful, The same sights grow tiresome after a point. Sea of Thieves is essentially an Early Access game. It has the groundwork figured out, and all that's left is to add more to do. 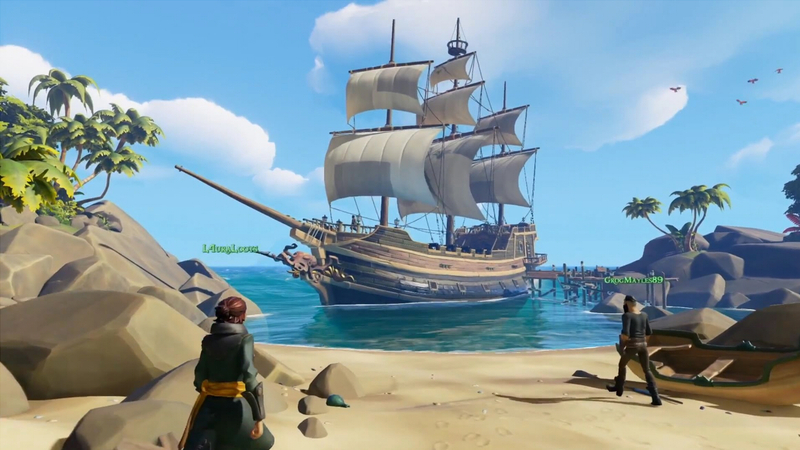 Rare themselves have even remarked that they intend to continue to build on the game over time. While this is all fine and dandy, this is a common trick used in the industry. If you make sales on the promise of more, you run the risk of losing trust if you don't follow through on those promises. Many gamers have taken to immediately disregarding early access games for this reason. More than the lack of content, there remains evidence of incompleteness in the menus. Playing with friends is done through the Xbox Live system, which many PC users are struggling to make work. In order to join friends or change the party you're in, you have to leave the game entirely. There is no character customization when creating a new player, you have to choose from randomly generated bodies. To be so optimized that you can run 30fps on integrated graphics cards, yet still have a clunky and awkward invite system reinforces the idea that they're simply not done making this game. Where the true heart of Sea of Thieves lies is in the multiplayer. The only other pirates you will come across are other players. Like with any online game, people are often chaotic and dangerous. When a game like this promotes the idea of pillage and plundering, then players embrace it happily. Whenever a player sees a ship in the distance, they're immediately cautious. Do they see us? are they going to come after us and attack? We have some valuable goods on board, I don't want to lose them. This aspect of the game can be very exciting when you get into a naval duel with another ship. But there's more frustration to be had from these altercations than anything. Skirmishes end either one of two ways. One crew kills the other, waits for them to respawn back on their ship, and kill them again, repeating this process until they self-destruct their own ship just to get away. Alternatively, one crew simply sinks the other's, forcing them to lose all of their hard-earned treasures. You run this risk at all times. Often times I'll change course so that I don't have to dock at the same port as another crew. One time, when I was exploring a small island for treasure, another ship sailed past and shot down my ship. Being away from my boat at the time, it sunk before I even had the chance to defend myself. This aspect of the game is easily my least favorite and is the reason I would stop playing a majority of the time. While inversely, the cooperative gameplay would be the driving force for the game's best moments. When you can manage to get friends together to coordinate a large ship and sail the high seas together, finding treasure and fighting skeletons, It's incredibly enjoyable. The open world and simple goals leave the doors open to shenanigans and comradery. 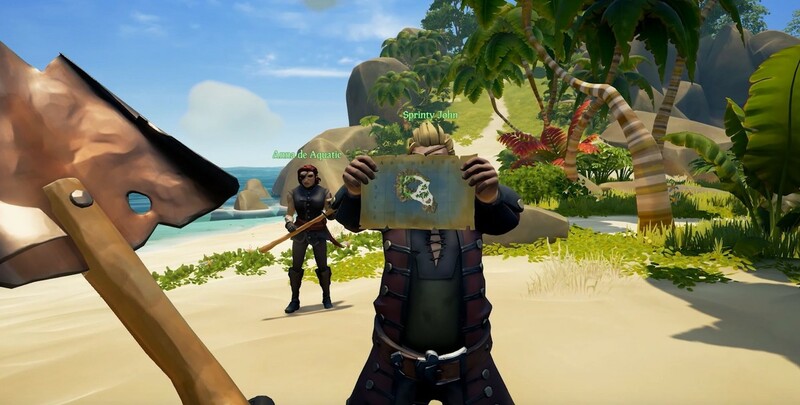 Much like bowling night, or poker with the guys, Sea of Thieves would make a fantastic activity to regularly revisit with friends. It doesn't even need to be friends. You can pair with strangers on your journey as well. While this runs the risk of being paired with silent and uncooperative players, you still have the chance to bond with another sailor over the ocean waves. There was an instance where I was partnered up with a man who will be referred to here as Neo. Neo was from Austria, but he spoke well enough English that we could communicate. He understood how ship sailing worked already, as well as the basics of gameplay. Marking a spot on the map, we would sail off towards our goal. I'd handle steering, while Neo would angle the sails, as well as raising and lowering them as needed. We worked together, often without saying a word, to operate our ship with complete competence. I've not seen Neo since, but I will certainly never forget our time. Sea of Thieves has some wonderfully feel-good components to it. The beautiful and refined ocean engine make for a unique gaming experience that can be shared with friends. Yet the good that is there is too easily overshadowed by the good that isn't there. The lack of content leaves players at a loss after only a few hours. The game feels empty in the grand scheme of things. It's full $60 price tag makes it hard to recommend in its current state. 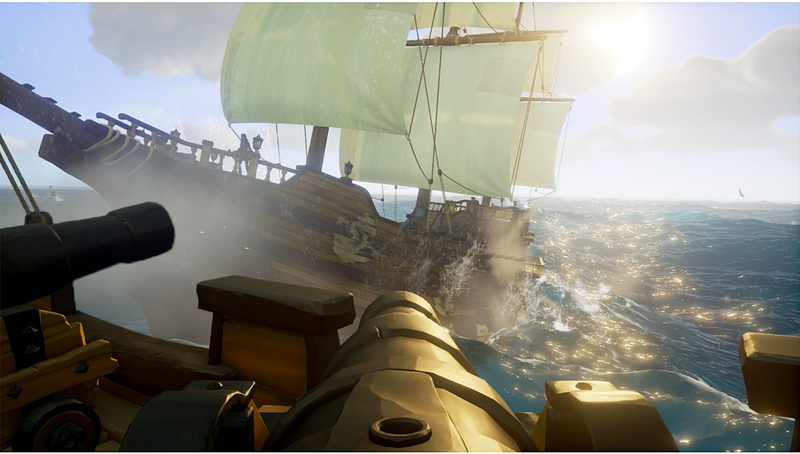 Sea of Thieves was developed by Rare and published by Microsoft. It released on March 20 for $60 on PC and Xbox One.